Universities in the USA and the UK continue to dominate an annual table ranking the world's top higher education institutions. Among the top 10 institutions in the Times Higher Education QS list, six are in the USA and four are in the UK. Harvard and Yale are in first and second places, with Cambridge and Oxford in third and fourth. The compilers of the list say technology-based universities are becoming more important. Caltech, MIT, ETH Zurich and Hong Kong University of Science and Technology all improved their position in the table, which is based on views of academics, citations in academic publications, opinions of employers and staff to student ratios. It is the fifth year that the list has been produced and the fifth year that Harvard University has led the field. Yale was in joint second place with Oxford and Cambridge last year but this year has that spot alone. Cambridge and Oxford slipped to third and fourth places respectively. Imperial College London fell from fifth to sixth place, while University College London, the last in the UK to make the top 10, rose from ninth to seventh place. Of the top 100 institutions 17 are from the UK, two fewer than in 2007, compared with 37 US universities. The editor of Times Higher Education, Ann Mroz, said: "UK universities are very clearly among the world's best and have maintained good positions in the rankings this year. 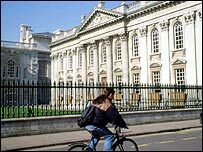 "But the fact that Cambridge and Oxford have slipped down the top 10 and that US universities have cemented their dominance among the world's elite - at the UK's expense - raises key questions about the future funding of the sector. "Harvard alone has an endowment that is about the same size as the total annual income for the whole of the UK university sector." More than 6,300 academics and 2,300 employers took part in the surveys used to compile the list. Academics are not allowed to vote for their own institutions. New entrants in the top 200 include: Technion - Israel Institute of Technology, Stony Brook University (USA), Indian Institute of Technology Delhi (IITD), VU University Amsterdam (Netherlands), University of Lausanne (Switzerland), Chulalongkorn University (Thailand), Universität Frankfurt am Main (Germany), Indian Institute of Technology Bombay (IITB), Lomonosov Moscow State University (Russia), Brandeis University (USA), Pohang University of Science and Technology (South Korea), Technische Universität Berlin (Germany), University of Bern (Switzerland), Dalhousie University (Canada), University of Buenos Aires (Argentina) and University of Athens (Greece). Ben Sowter, from QS, says there is a "reasonably strong trend" of technology-based institutions moving up the world rankings. Thirteen of those in the top 100 were strong on technology, he said. He said such institutions scored particularly well in the survey of employers. "People with strong numerical and problem-solving skills seem to be appreciated by employers." Such institutions seemed to be becoming more important in many regions of the world, he said. The director general of the Russell Group of leading UK universities, Dr Wendy Piatt, said it had reservations about the use and accuracy of "league tables" but the group was pleased that its member universities were continuing to perform well against major global competitors. But she added: "We are very concerned about our ability to sustain this level of success in the face of fierce global competition. "The table reflects the growing strength of our major competitors - particularly the US institutions - who benefit from much higher levels of investment than UK universities. "As a result of huge investment in higher education and science in recent years, China already looks set to overtake the UK very soon in terms of total research publications, and its universities have been steadily climbing up international league tables," she said. England's Higher Education Minister David Lammy said the table was further evidence that its higher education system was world class. "But we are not complacent. Excellence today is no guarantee of excellence in 10 - 15 years' time. "There are plenty of countries both developed and emerging that will want to challenge our position and that is why we are having a debate on the challenges we will need to overcome to have a world class system into the future." So by 2011 it was planned that funding would have increased by 30% in real terms since 1997, to £11bn a year.